Every so often I get a sneak peak at a book that hasn't been released yet and I'm like a kid in a candy store. 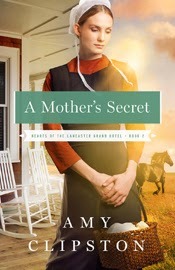 A Mother's Secret was a book that gave an entirely new insight into a culture that has long fascinated me. What happens when a young girl makes a mistake? I won't tell you the answer because I don't want to spoil anything for you, but I will encourage you to pick up this book and find out for yourself. My only complaint? One of the questions in this book wasn't answered, but as this is a book that's part of a series, I expect that it will be answered in the book to come. With any luck, I'll have the opportunity to review it so I can find out!